Lavera Basis Sensitiv Organic Lip Balm offers protection and hydration to your lips thanks to its cocktail of natural ingredients. Shea butter deeply nourishes the lips and organic wax deposits a light film that protects the skin from external aggressions. Thanks to their softening properties, jojoba and sweet almond vegetable oils soothe and prevent irritation. This stick is ideal in case of chapped and dry lips! Lavera Basis Sensitiv Organic Lip Balm is a must for soft, perfectly nourished lips! 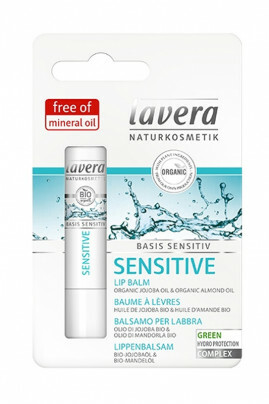 Lavera Basis Sensitiv Organic Lip Balm for soft lips every day! Apply this balm to your lips as soon as you feel the need throughout the day. A cocktail of organic and natural ingredients in this Lavera lip balm!